After 2016, media outlets feverishly raided donut shops and diners in the Midwest to explain the phenomenon of the Obama-Trump voter, missing possibly the revolt against the GOP in suburban districts that would in 2018 cost Republicans the House. Here, we use a unique survey dataset to explore the attitudes of these swing vote switchers in 2018. These voters were responsible for surprises like Trump winning states Democrats had considered a Blue Wall, which then all gave Democrats large victories again in 2018. These combinations do not cover every possible set of vote choice behavior between 2012, 2016, and 2018. For example, a voter may have chosen Mitt Romney in 2012, Hillary Clinton in 2016, and a House Republican candidate in 2018. As is generally true of a losing candidate, Romney likely did not attract many Democrats who then swung back to their party in 2016, nor did Clinton attract many Republicans who then went home in 2018. Our sample bears this out: Including survey weights, just ten of the 3,215 respondents in this portion of the survey would identify as “Rep-Dem-Rep” voters. For 2012 and 2016 vote, we pulled respondent data from the YouGov panel. An important feature of most of these groups, aside from the loyal Democrats and loyal Republicans, is that these groups are very small. Most voters are consistent partisans, and switchers are rare, something that is not surprising given the increased polarization that has dominated national politics for the past half-century. The survey includes 1,152 loyal Democrats, 1,017 loyal Republicans, 35 Rep-Dem-Dem voters, 30 Dem-Rep-Dem voters, 44 Rep-Rep-Dem voters, and 70 Dem-Rep-Rep voters. We acknowledge that these are very small sample sizes. As we caution throughout, these results should only be viewed as exploratory. What we offer is a set of suggestive patterns about this electorate that should be useful for future research and for setting the stage for the conversations progressives and Democrats will need to have about their positioning in future elections. 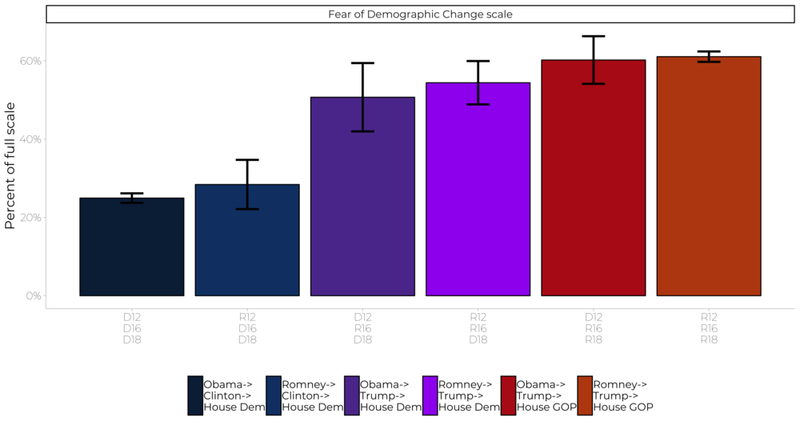 In this post, we begin by offering some insights into how these different groups of voters look along certain demographic measures, and we provide a preliminary look at some of their self-reported political beliefs and policy preferences. Because we are limiting our analysis to those with past vote history in recent elections, it isn’t surprising that they’re older than the average American. For each of the voting categories we study here the average age was between 52 and 55 except for loyal Republicans and Rep-Rep-Dem voters, whose average ages were each about 61. The following figure plots the share of each category voter by the share of that category under the age of fifty. Perhaps not surprisingly, more loyal Democrats were typically generally younger. 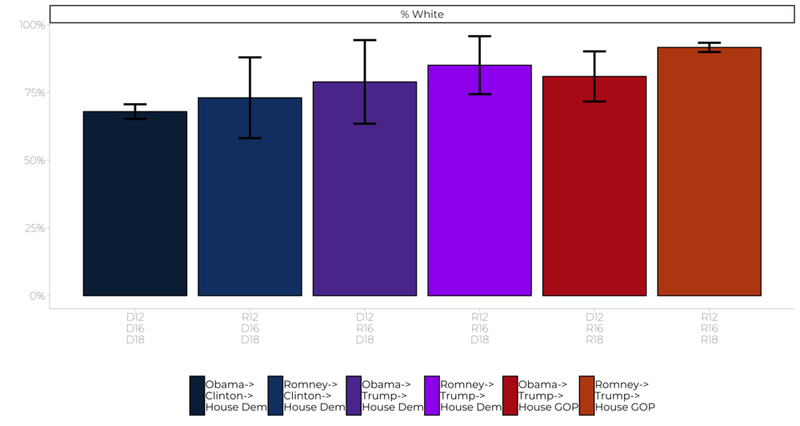 Perhaps also unsurprisingly, as voter categories move from left to right, they become gradually whiter. 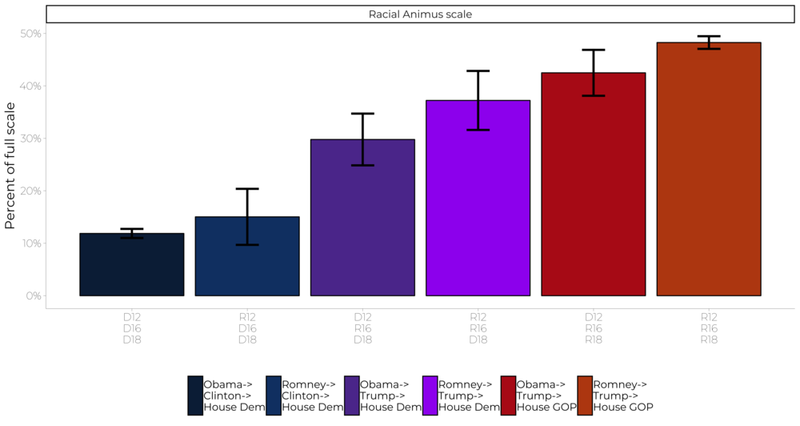 While loyal Democrats are closest to representing a cross-section of the population at being 68 percent white, 22 percent Black, 7 percent Latinx, and 3 percent other race, fully 92 percent of loyal Republican voters were white, 6 percent Latinx, and about 2 percent Black and other race. 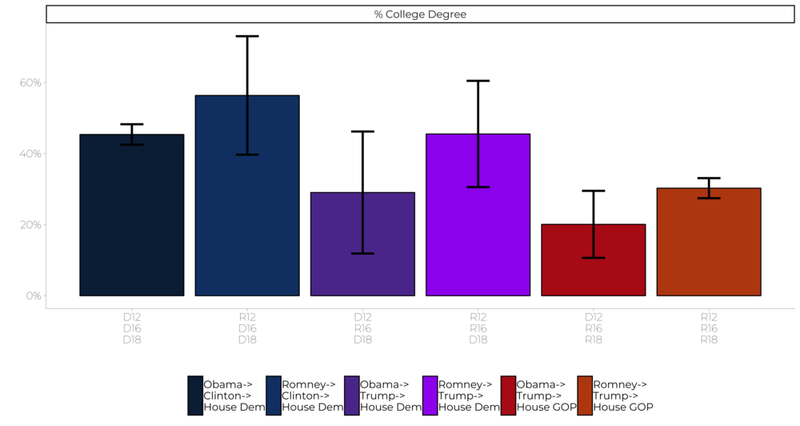 Across the voter breakdowns in our sample, the relatively high variation in the smaller groups makes it difficult to draw a clear set of distinctions, but generally speaking, a slightly higher share of voters who broke for Democrats in 2018 had a college degree than did voters who chose Republican candidates in 2018. About 45 percent of loyal Democratic voters had a college degree or above, compared with about 31 percent of loyal Republican voters. 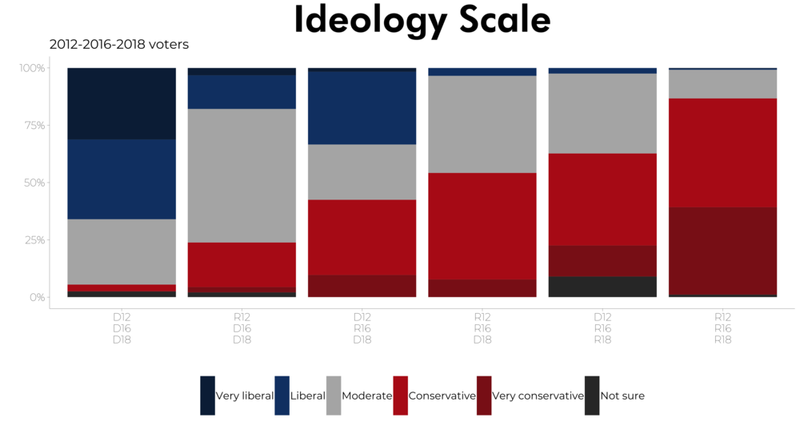 Not surprisingly, self-identified political moderates formed pluralities among the vote switcher categories, and formed an outright majority of Romney voters who have since gone Democratic in 2016 and 2018. But fully 42 percent of Obama-Trump voters who returned to the Democratic Party in 2018 identified as conservative, compared with 33 percent who identified as liberal. Fully 54 percent of Romney-Trump voters who defected to a Democratic candidate in 2018 identified as conservative or very conservative. Similarly, in terms of party identification, a majority of the Obama-Trump voters who voted for a Democratic candidate in 2018 identified as Democrats, compared with a Republican majority of Romney-Trump voters who broke Democratic in 2018. This result vexes some hot takes about the nature of the 2020 election landscape: In a Presidential year, partisans will come home to a greater degree than they typically will in a midterm election, meaning the electoral coalitions assembled by either party in 2018 are not necessarily reliable guideposts for the coalitions they’ll need in the future. In many future elections, Democrats will need the votes of at least some reliable Republicans. The 2018 election cycle has shown that the current Republican obsession with racist appeals and white identity will not serve them well in the future. Between straight-Democratic and straight-Republican voters lies an array of party switchers who score lower on measures of racial animus than the GOP’s continued electoral fortunes require them to be. We find net support for a green jobs guarantee among voters in all categories. Indeed, some punditry to this effect motivated early suspicion that Trump might have tried to corner Democratic legislators with an infrastructure plan partially to this effect had he not lacked the political acumen and Mitch McConnell not been so pro-unemployment for the poor. Another cornerstone of the Green New Deal, levying pollution fees on business that produce high levels of greenhouse gases, currently enjoys support across the political spectrum. Aside from loyal Republican voters, who are narrowly split on pollution fees 35-40, loyal Democrats through Obama-Trump-2018 Republican voters approve of this item. Perhaps unsurprisingly, partisans were split on the issue of gun control, with recent party switchers split down the middle. Respondents who voted Democratic in the last two or three elections overwhelmingly favor more gun control, while respondents who have voted Republican since at least 2012 overwhelmingly oppose more gun control. We do not have the sample size or narrowness of results to conclude whether Obama-Trump or Romney-Trump voters who swung to Democrats in 2018 support more gun control. Ultimately, voters across our sample on net are ready, if tepidly, to consider new gun regulations. Overall, unsurprisingly, loyal Democrats on net support the progressive agenda we studied here. Perhaps more surprisingly, some fairly ambitious progressive policy goals appealed to loyal Republican voters, and those who voted for Trump then swung to a Democrat in 2018 were amenable to many of these policies on net. Having flipped at least forty seats in the House, seven Governorships, and a half-dozen state legislatures in 2018 with the help of a broad coalition of voters from across the political spectrum, Democrats have no excuse not to pursue a progressive policy agenda going forward. Some of these policies, like the Green New Deal, have yet to enter the public debate broadly, while others, like gun control and Medicare-for-all, have been debated for years. Thus, there is some asymmetry in how much we should expect the public to align with their party’s elites on each. Nevertheless, as it stands, Democrats are (and should be) expected to advance a progressive platform using the power voters have chosen to give them. Vote switchers make up a relatively small portion of the electorate, but it’s important to understand their attitudes. We find some evidence that Romney-Clinton voters have similar beliefs to loyal Democrats, and some evidence that Obama-Trump voters who swung back to the Democrats do as well. On issues from hostile sexism and racial animus to concerns about a majority people of color nation, these voters resemble the rest of the Democratic coalition. While more work is needed to focus specifically on persuadable voters, these findings present a road map for future work and for understanding our present context in the aftermath of the 2018 midterms. Alissa Stollwerk (@AlissaStollwerk) is Director of YouGov Blue. Editor’s Note: An earlier version of several policy plots erroneously included ‘Don’t know’ as an opposition position. These have been corrected from the version of this post released the morning of November 29. This error affected the apparent levels of support for the plots of the Medicare for All, gun control, abolishing ICE, border security, and tuition assistance plots, as well as the final summary plot of overall support for each policy by group.